The snowdrop was @SpeciesofUK from 13th to 19th January 2013. They are found in damp woods, streamsides, meadows, amongst scrub and in shady gardens. Snowdrop flowers carpet the ground in the UK between late January and early April. A carpet of snowdrops really is one of the most beautiful natural sights in the UK. Snowdrop leaves are strap-like, and blue-green in colour. There are two leaves, held flat against each other in bud. The fruit or seedhead is a small, near-spherical capsule containing tiny pale brown seeds. Snowdrops are known for being one of the earliest UK bulbs to flower. They are traditionally seen to herald the end of the winter. Snowdrops leaves have hardened tips, enabling the plant to appear early in the year, ever when the ground is hard, frozen or snow-covered. The flowering stem is also covered in a small leaf-like spathe, or protective sheath, enabling it to force its way through the hardened ground along with the leaves. The BBC has a time lapse video of snowdrops pushing up through the snow. 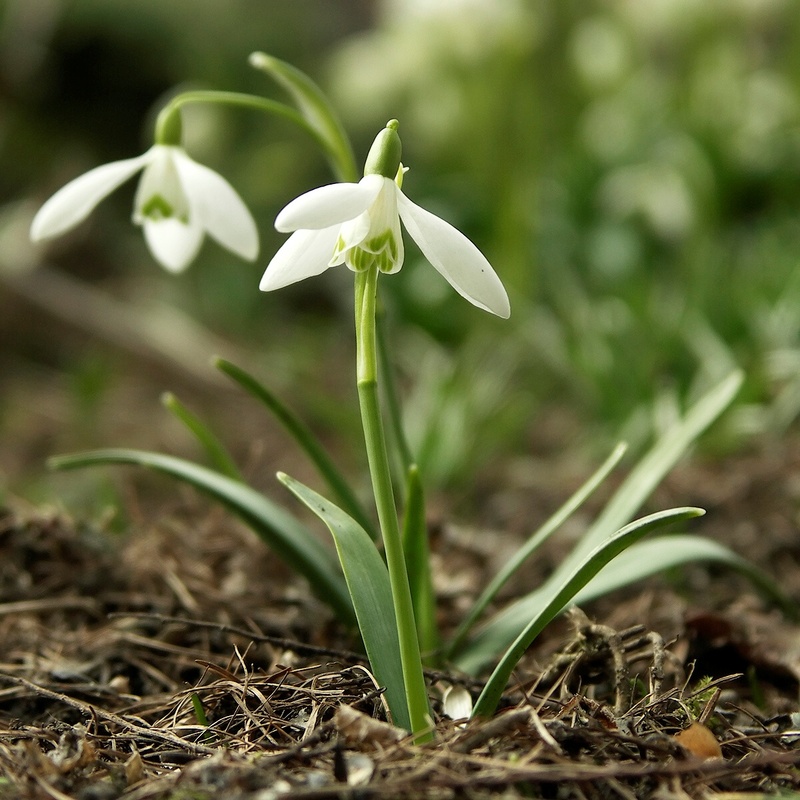 The name “snowdrop” first appeared in the UK in the seventeenth century. The name “February fairmaids” also relates to Candlemas, which is otherwise known as the Feast of Purification of St Mary, when village maidens would wear snowdrops as symbols of purity. The name “Death's flower” relates to the belief that a single flower indicates impending death. The Latin name for the common snowdrop is Galanthus nivalis. The genus name, Galanthus, means milk-flower, and the species name nivalis means snowy. Bulb division is a common method of reproduction in some plants. It is asexual so avoids the hazards of sexual reproduction (seeds/flowers). The snowdrop bulb is never truly dormant as the bulb is always working on next year’s flowers and leaves. Here is a good summary of the different forms of asexual reproduction in plants, including the snowdrop. The snowdrop is cultivated widely and commonly planted in gardens and parks in the UK. The snowdrop is one of the most popular of all cultivated bulbous plants. Millions are sold every year.9 It is easy to grow. Once planted, snowdrops spread freely. They need shade, and soil with good drainage. There are numerous cultivars of snowdrops. Cultivators are plants selected for desirable characteristics which can be maintained by human-controlled propagation, a bit like the way different breeds of dog originated. A popular and very ancient snowdrop cultivar is the double snowdrop, which has 3-5 outer segments and 12-21 inners. There are many many other cultivars, include giant snowdrops, snowdrops with long petals, and rare yellow kinds. Snowdrops flower a lot earlier than they used to. In the 1950s they flowered at the end of February, but now it’s January. This could be linked to the UK experiencing milder winters.